I saw this recipe here. And I loved it. I wanted to try it immediately. But it needed so much oil.. well, I thought, once in a while it is okay to cook such yummy dish. But again, my weighing machine told me I was crossing the acceptable weight. My jeans was telling me i was losing shape…. Marinate chicken with Salt and Turmeric. Set aside for an hour. Heat oil for frying in a deep wok and fry the chicken pieces till golden, drain on paper and keep aside. Put Onion, Lemongrass, Red chillies and Ginger Garlic paste in a food processor and make a coarse paste. Heat 1/4 cup oil in a wide pan. Add cinnamon, cloves, cardamom and star anise, until it emit a nice aroma. Add the processed onion paste. Fry till the raw smell disappears and is fragrant and oil separates. 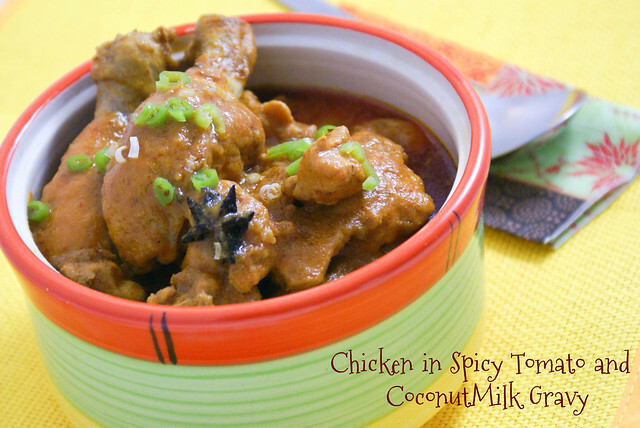 Add tomato soup, coconut milk and chicken pieces. Lower the heat and cook till the sauce thickens. Garnish with spring onion, and serve hot with rice or rotis. If you don’t have tomato soup, you can use tomato puree. Use the homemade puree, I feel store bought very tangy. If you don’t want so much fat in your dish, you can skip frying the chicken pieces before hand, and add them directly in Step 7 and cook till done. 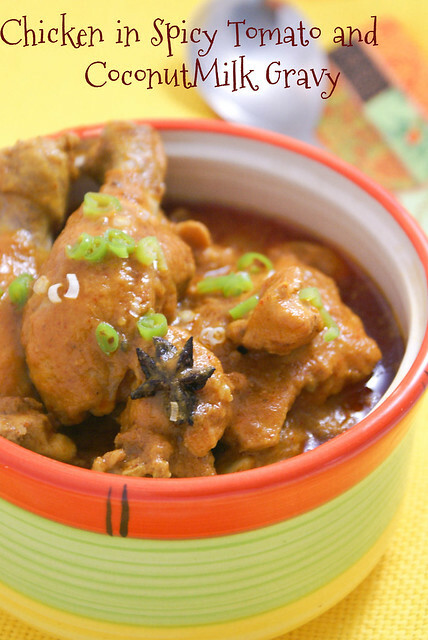 wonderful and delicious curry with tempting clicks ……. Omg, cant take my eyes from ur fascinating click,fingerlicking dish. Ooh! Tomato soup and coconut milk! You got our attention 🙂 Looks yum!